Sometimes when you walk on the beach it can happen that you suddenly see a bottle. So..........??? you think. But if you look closely, you see that there is something inside! There's a letter in the bottle! This is called a message in a bottle. In the old days if a letter in a bottle washed up this usually meant nothing good. Most of the time it was a message from a ship crew that was in distress. Often it was the last message home. Fortunately, now a days distress signals are a lot better and rescuers arrive often very quickly on the sceen. Are you curious about the message in the bottle? Are you wondering where the message comes from? Do you also wonder how long the message has been travelling? In the Juttersmu-SEA-um, we have quite a lot of washed up letters.The number and type of messages vary tremendously. Are you curious about the story behind it? Discover the answers to these questions in the Beachcomber museum. The volunteers love to tell you about it. 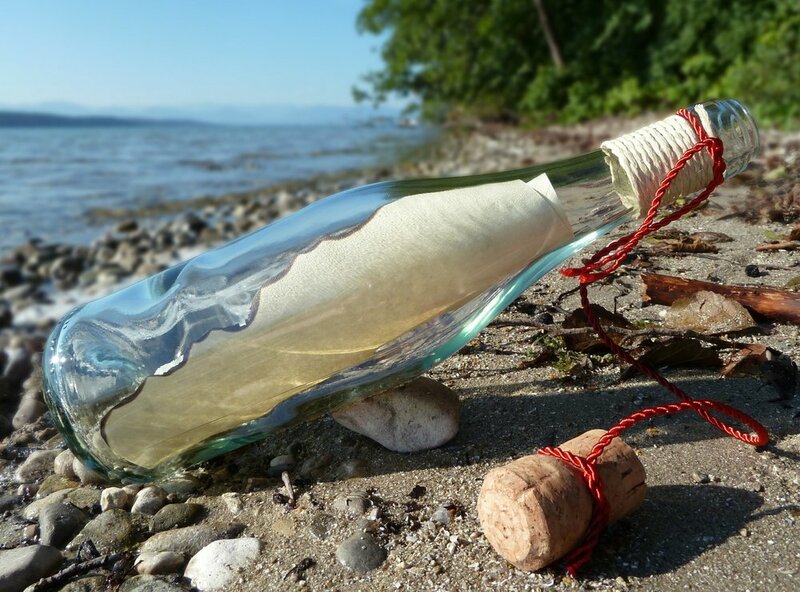 Would you like to send a message in a bottle yourself? Put your name, address and date clearly on the letter and ask the finder if they want to answers it. Also ask whether the finder could mention the date indicated on the letter found and the date they found your bottle, so you know which bottle it is if you sent out several messages. Perhaps your teacher, your father or mother, can also write the text in a different language in case the message travels a very long way. Try to make the bottle a bit heavier (eg. handful of sand), they travel the farthest. Put your letter in the bottle. From the Netherlands you can only send bottles with offshore wind.